YOU ARE HERE : HOME / FREE MARKET TIPS-BLOG!! / What is Put – Call Ratio and what does it says about Nifty? What is Put – Call Ratio and what does it says about Nifty? There are many signals and indicators high-lighting that stock market might be overbought. As most of my readers know, I am not a big fan of Indicators but Market sentiment is something we can’t ignore and we must pay attention to sentiment indicators which have good probability of anticipating future market directions. Put call ratio is one such an Indicator. The Put – Call ratio of Nifty is at its peak since September 2010.This indication has made professional traders a bit cautious about stock market because Peak Put call ratio means overbought market conditions. Put Call Ratio helps the trader to understand whether a recent rise or fall in the stock market is climatic or not and take a contrarian trading decisions based on that. As a rule of thumb, higher PCR indicates the time to sell and a lower PCR indicates the time to buy. – Put trading volume divided by call trading volume. – Put open interest divided by Call open interest on a given day. 3. In addition, the PCR can be calculated either for each stock or for the entire derivative segment. The put-call ratio is a sentiment Indicator which measures the views of Market participants for forecasting future market direction,( I normally combine it with my Price action trading strategies when trading Nifty, Bank nifty and Vix) It’s a ratio between the trading volume or Open Interest of put options to call options. Traders arrive at a bullish sentiment when the number of traded call options outpaces the number of traded put options, and vice versa. If this ratio rises, it means the investors are investing more into put options, as compared to call options. On one hand, the traders prefer to buy when the PCR is below 1 i.e they buy more call options than put options while on the other hand, traders prefer to sell when PCR is above 1 i.e they buy more put options than call options. Many Fund managers use a prominent approach to buy index put options to protect their portfolios incase if stock prices decline. Also, the put-call ratio for index options is always generally higher than that of equity options. 1)If PCR is in the range of 0.6-0.7, it’s on the lower side – Observe the Buying pressures reflected in Price action, read the Market behavior and if all is well, wait for potential bullish Price action setups to take a trading decision in Options. 2)If PCR in the range of 1.4-1.5, it’s on the higher side – Observe the Selling pressures reflected in Price action read the Market behavior and if all is well, wait for potential bearish Price action setups to take a trading decision in Options. According to the recent updates, the put-call ratio is somewhere near 1.50. In 2017, the Nifty 50 index gained about 28%. This has made some institutional investors cautious about the market conditions. In other words they’re worried about higher valuations leading to some correction. In the current context, Nifty 50 is in Structural Bull Market over long-term, we may witness a short-term decline or selloff due to Overvalued Market conditions but that also depends on 2018 Budget. (These factors won’t have much Impact on structural bull market.) 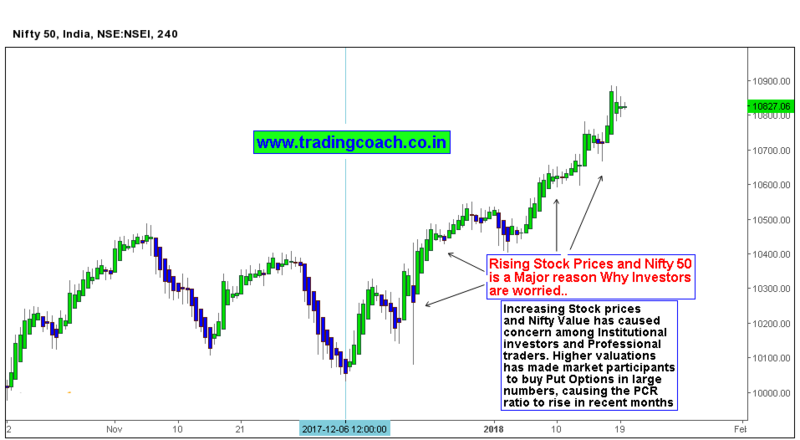 So keep an eye on Price action of Nifty 50, Bank nifty and take trades accordingly.